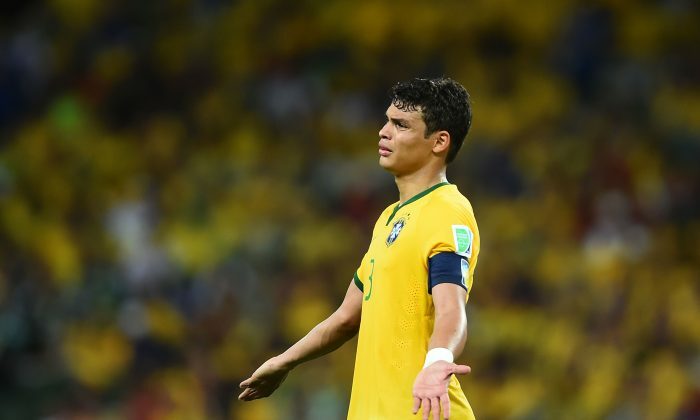 Thiago Silva is Brazil’s football national captain, and a Paris Saint-Germain player. The 29-year-old defender is widely considered to be the best center back in the world at present. In the 2013/2014 season, Silva made 34 appearances for PSG, and scored 3 goals. SAO PAULO (AP) — The streets seem too quiet, diners and souvenir stores, empty. For two whole days now, the globe has gone without World Cup soccer matches in this most electrifying of tournaments in decades. There were no matches on Wednesday and Thursday as teams still standing took a break before heading into Friday’s quarterfinal matches. All the non-action has left some fans simply bored. Others are using the time to do simple chores that are impossible to get done when the ball rolls in soccer-loving nations, either because they cannot tear themselves away from the TV or because entire nations like Brazil shut down due to declared holidays on game days. It’s not just the emptier restaurants and stores — it’s locals missing the vibe from the rocking Fan Fests and the sight of foreigners dressed in their country’s colors chanting in the street, in subway stations or on plazas or beaches. Still, from Brazil to Argentina to Colombia, soccer fans are also taking advantage of the break. Women headed out to the salon to get nails done and tousled hair tamed. Others went to malls, most of which close when Brazil plays or when there is a Cup match in their city. In Colombia, people are filling the match void by talking nonstop of that nation’s epic game with Brazil on Friday. It’s all people discuss in restaurants and at work. Expecting traffic chaos, Luis Garzon, who works as a private driver, said he used this two-day break to pay bills and buy groceries, all to be ready to pay total attention to Friday’s match. “I went to repair my car, I paid the electric bill and went to the supermarket so I don’t have anything to do these next two weeks,” he said, referring to the mad dash toward the final match on July 13. In Argentina, 21-year-old law student Camila Fernandez said the Cup had come at the same time as her finals. So, naturally, some teachers changed the dates of their tests so everybody could watch their country play. Local newspapers were running tips on what to do during the two days of no games: Play with your children, go to the movies, or, if you really cannot take the lack of soccer, simply watch the matches again. Rio taxi driver Christian da Silva Pires said he doesn’t feel like his normal self without the Cup action. There are no matches to listen to on his radio and no passengers rushing to bars or relatives’ homes to watch games.